As senior captain of her high school volleyball team, Brooke Johnson was determined to lead her squad to the state tournament. Never mind that the team hadn’t made it there before. Or that her small school had never sent any athletic team to a state tournament. Or that Brooke had health issues that made playing a challenge. Not even that she required extensive hip surgery four months before the season started. None of that mattered to Brooke. The obstacles in her path were significant. Her team at Mayo Clinic in Rochester, Minnesota, worked with Brooke, though, to see her through to her goal. 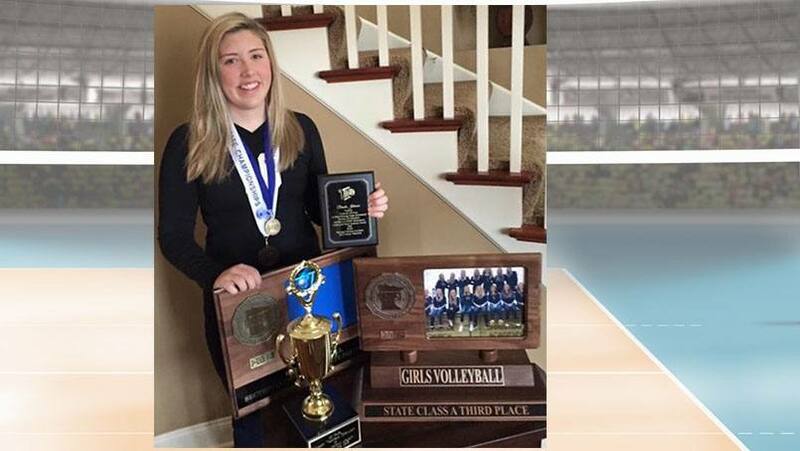 And in November 2015, her Heritage Christian Academy volleyball team made its first appearance in the Minnesota state high school tournament, earning third place overall. Brooke has dealt with a variety of health issues over the years, including Ehlers-Danlos syndrome, rheumatoid arthritis and problems with her autonomic nervous system. Brooke originally came to Mayo Clinic to have all the specialty medical care she needed coordinated in one place. In early 2015, Brooke began having sharp pain in her hips. The pain became so severe that eventually she was unable to walk. Her Mayo Clinic orthopedic physician referred her to Dr. Levy in the Department of Orthopedic Surgery. Dr. Levy ordered a series of imaging exams that showed tears in the ring of cartilage, called labrum, around the outside rim of Brooke’s hip joints. The hip labral tears were likely a symptom of Ehlers-Danlos. But it was difficult to tell if the pain was a result of those tears or due to her rheumatoid arthritis. To ease her pain, as well as help determine its source, Brooke needed corticosteroid shots in both her hips. If the pain was coming from the tears, the shots would quickly relieve Brooke’s discomfort. Because the pain was so intense, it was essential for Brooke to get treatment as soon as possible. To make that happen, Dr. Levy arranged for her to receive the corticosteroid shots at the Mayo Clinic Sports Medicine Center in Minneapolis, near Brooke’s hometown of Maple Grove, Minnesota. Soon after the injections, Brooke was able to walk without pain. That indicated the tears were the problem, and the hip sockets had to be repaired. Surgery on her right hip was scheduled for less than a week later. Although her surgical team had hoped for a simple repair, Brooke’s surgery was substantial. In addition to several large labral tears, she also had hip impingement — a condition where the ball and socket of the hip joint don't fit together properly. Fixing her hip involved shaving off part of the bone, reattaching the labrum with pins and sewing up the tears. Recovery was projected to take months, stretching well into Brooke’s volleyball schedule. But she was determined not to miss her senior season and dedicated herself to hours of physical therapy each day. In mid-September, Brooke talked to Dr. Levy about her desire to play. He worked with her to make it happen. Brooke made it back to the court for the first time in October. As the season progressed, so did her ability to play. By November, she was regularly on the court with her team, and they earned a spot in the state tournament. When she went back for a checkup a week after their third place tournament finish, Brooke was pleased to report the accomplishment to her physician. In March 2016, Brooke had surgery to repair her left hip. Another lengthy recovery followed, but she made significant progress in the months afterward and was able to walk across the stage unassisted at her high school graduation to receive her diploma. She now plans to attend college in the fall and work toward a degree in athletic training. Inspired by her care team, Brooke ultimately would like to be a health care professional. Her mom also sees the lasting effect Brooke’s care team at Mayo Clinic has had not only on her daughter’s health, but on her life overall. Learn more about Mayo Clinic Sports Medicine. Read about orthopedic surgery at Mayo Clinic.